It’s amazing how slow weeks go by when you’re recovering from an illness or injury, or waiting for someone you love to return from a long time away, but when you have a deadline to meet the time goes lightning fast! Here we are at the end of the One Room Challenge – it’s been such a fun, motivating, inspiring round this year! 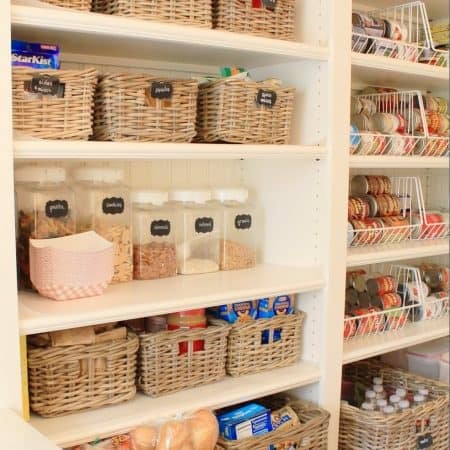 There’s such a great sense of community and I hope that as a reader you are enjoying seeing so many different kinds of rooms and styles, within many different budget scenarios – there’s really something for everyone! The makeovers between the 20 featured designers and close to 200 linking participants will be revealed next Wednesday and Thursday so it’s go time – I know I am not alone in finishing up a million little details!! 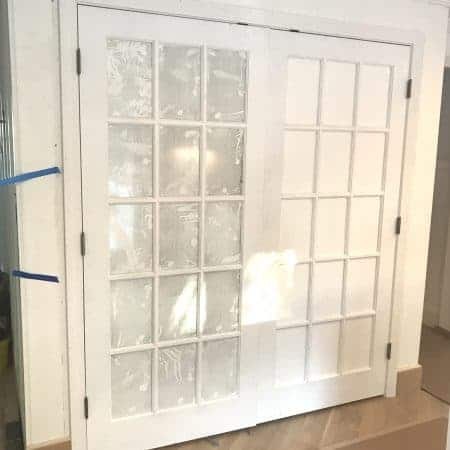 I find with every single carpentry project I do, there are unique aspects to figure out, and in retrospect there are ALWAYS little bits and pieces I would have done differently, but it’s a learning process. As always I am humbled by how much of a skill and talent truly beautiful finished carpentry is and how much more I have to learn. The only thing I called in the pros for was having two electrical boxes installed for the sconces. The sconces themselves were plug-ins, which are easy to convert to hardwired, so Chris the electrician did that for me as well. 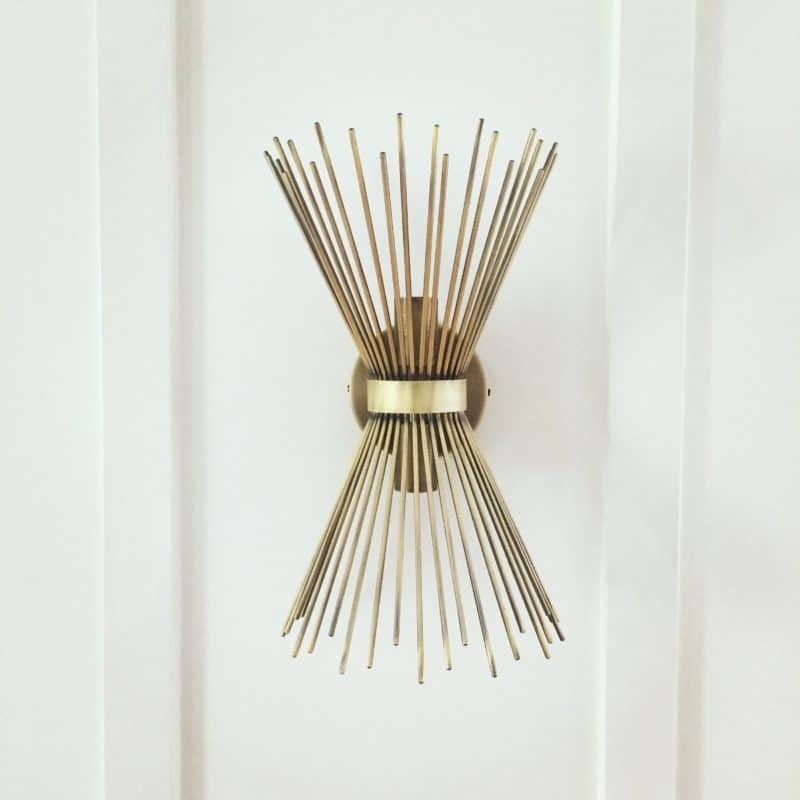 I admit that even though almost all of you voted for these sconces, up until they were installed I was not 100% sure about them in this room, but now that they’re in, and the art is on the wall, I’m sold! What do you think? 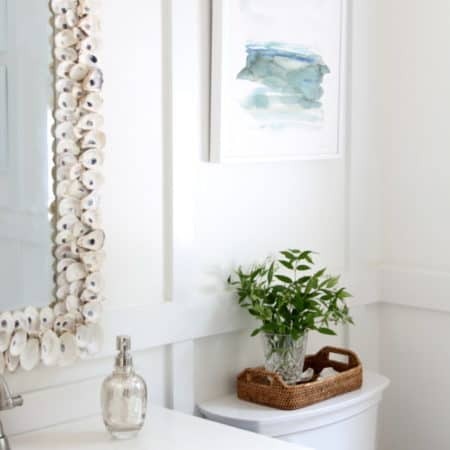 I have been slowly changing out all the outlets and light switches in our house myself since that’s usually a pretty straightforward task a homeowner can take on. Make sure you shut the power off first of course! 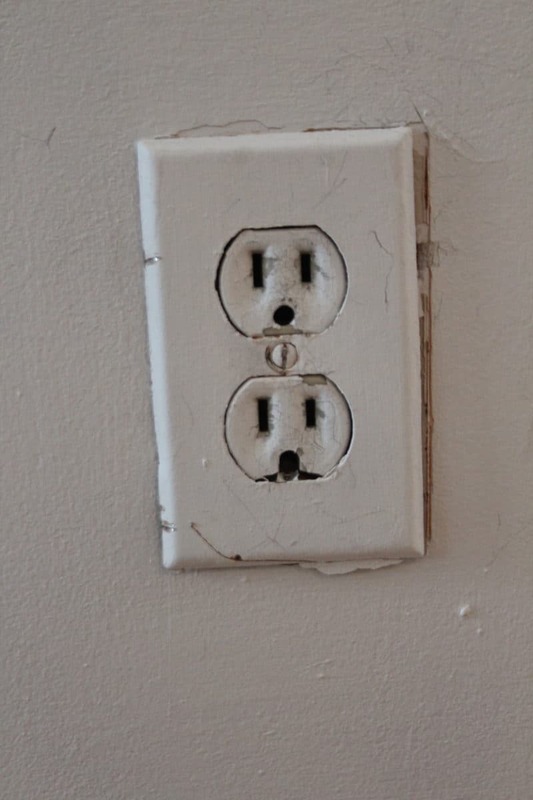 So there’s your tip for the day – don’t paint over outlets and replace ones that have been painted over. It’s just not worth the few bucks you save to buy new ones and replace them yourself! A couple other noteworthy events from this week – I found a piece of art I love! It’s totally different than I had envisioned but I brought it home and “dated it” for a few days and it’s definitely a keeper!!!! You’ll have to wait for the reveal to see it though! Also, my 15 year old son Sean and I moved the two big huge cumbersome club chairs that I reupholstered out of the room, that was a feat in itself. I still can’t believe how many hours I poured into these two chairs. 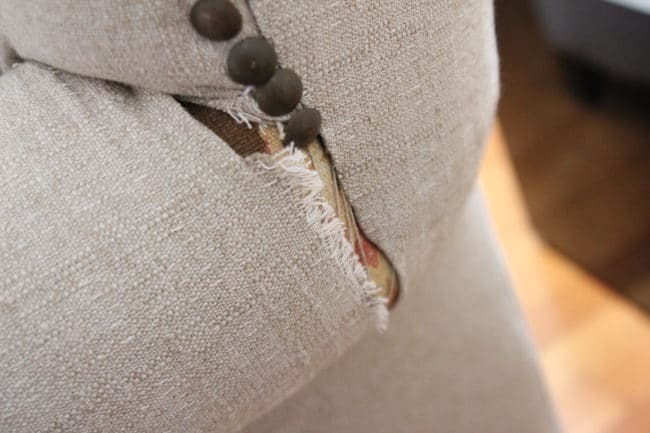 Suffice it to say I won’t be reupholstering again any time soon! 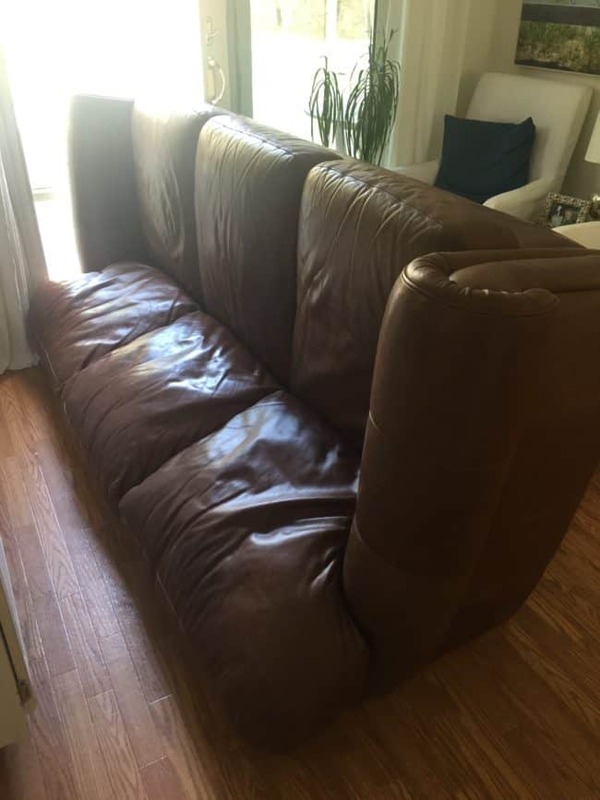 I also singlehandedly managed to move the big buxom leather couch out of the room when Mark had to make a mad dash out the door for a last minute meeting he couldn’t put off! I was all, I totally get it, go right ahead, I’ll take care of it, and then I sat on the family room floor in disbelief for a few minutes while seriously considering busting Sean out of school for a half hour to help me move it. Then the coffee kicked in, and I took the feet off the couch, and turned it on it’s side and pushed it through the narrow doorway into the kitchen. The guys can move it down to the basement later, but at least it’s out of the room so I could lay down the new rug pad and rug before the furniture arrives! I’ve mentioned before that we desperately need to have the wood floors in here as well as the living room and dining room refinished, but we’re waiting until we can tackle pulling up the 80s tile in our foyer and the linoleum in our kitchen and have hardwood installed in those rooms at the same time. I’m really excited to do a different stain on the floor, that is going to be such a house game changer!! 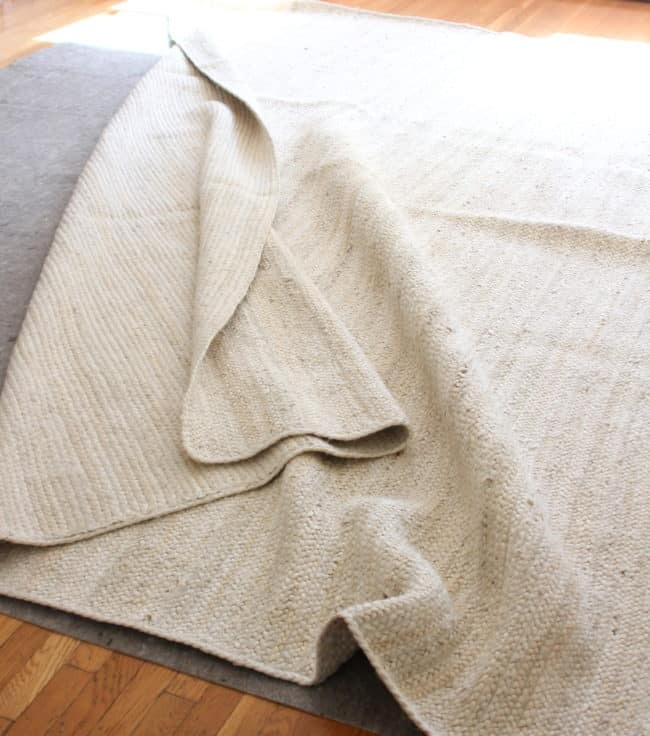 In the meantime I love the new braided jute rug and the rubber/felt rug pad is perfect with it! Well – today is the big day!! The furniture is arriving from Raymour & Flanigan!!! I just love this store and how helpful and accommodating everyone there is. From my several shopping visits to the showroom hunting down the perfect pieces, to coordinating the delivery on my tight schedule (they deliver seven days a week and in-stock items can be delivered within three days) it’s been a dream to work with them, and I still can’t believe I found the exact velvet Chesterfield I had always wanted there! I haven’t seen all the pieces together yet, so I’m praying they all work in the room the way I envisioned. I also have been so consumed with the installation, caulking, puttying, sanding, and painting of the moulding that I still have to tackle the cabinet doors and give the shelves some love, wish me luck! My hit list is slowly getting banged out, woohoo!! Empty bookcases • order bookcase cabinet doors and knobs • install cabinet doors • figure out room layout • order furniture (couch, settee,chairs?) 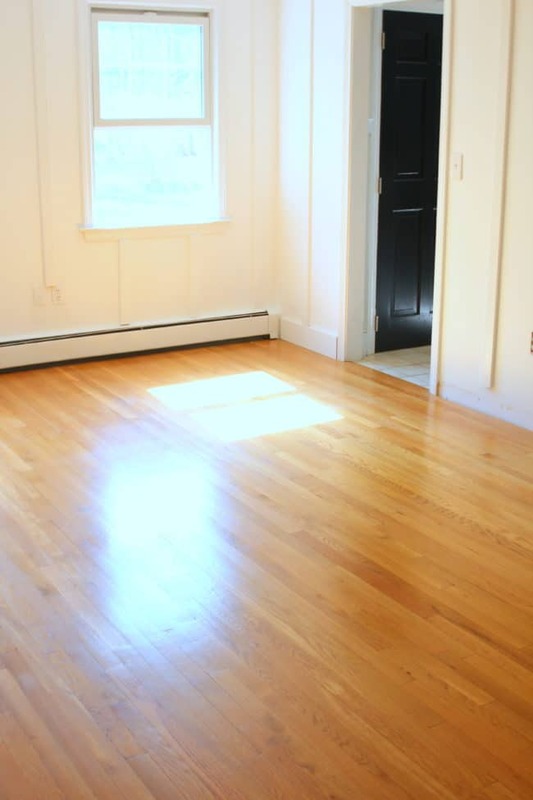 • find a 9×12 rug • figure out art – over couch, next to bookcases, adjacent hall • install art • choose sconces for over couch • add sconces over bookcases? 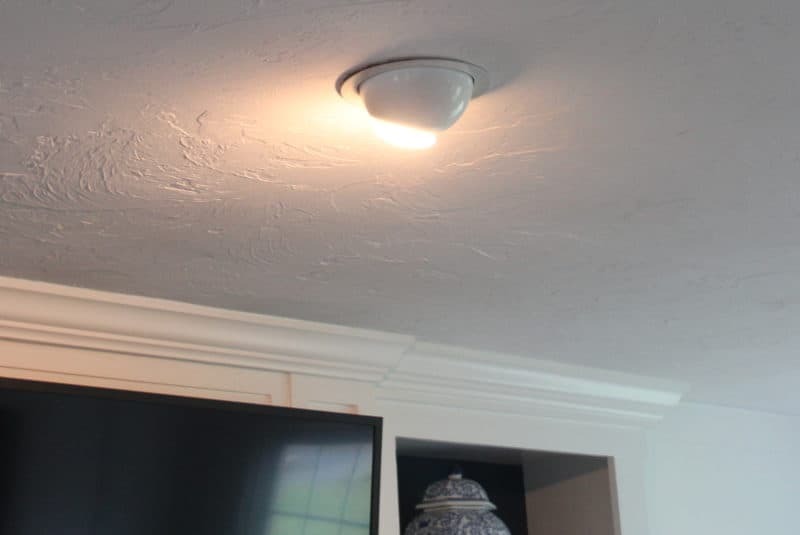 • schedule electrician to remove eyeball light, move alarm box, install sconce light boxes • figure out wall moulding design • measure for lumber • buy lumber and supplies • install wall moulding • install crown moulding • caulk moulding • paint moulding • clean out fireplace • freshen up paint on fireplace and bookcases • clean and seal marble fireplace surround and hearth • find interesting Craigslist/thrift store end table(s)? • style • photograph • done! and especially to my wonderful ORC sponsor Raymour & Flanigan for helping me share the ins-and-outs of a complete room re-design with you! 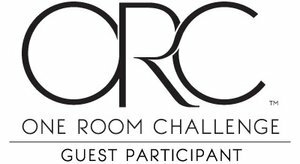 BEST WISHES to everyone who is participating in this round of the One Room Challenge, may you have a productive week ahead! It’s such fun to see so many different kinds of rooms, and all the clever ideas, mad skills, and beauty that emerges from these six weeks of mayhem!! Thanks to everyone who has been stopping by to check on my progress and cheering me on these last few weeks. I appreciate your feedback and your kindness so very much and am grateful for this little community of people who love the art of creating a home as much as I do! Thanks Michelle! I do have a lot of things crossed off my list but I keep adding onto it! Hope you’re getting there, can’t wait to see your space all done this week! Ahh, you’ve gotten so much stuff done this week! Isn’t that crown moulding a pain sometimes? 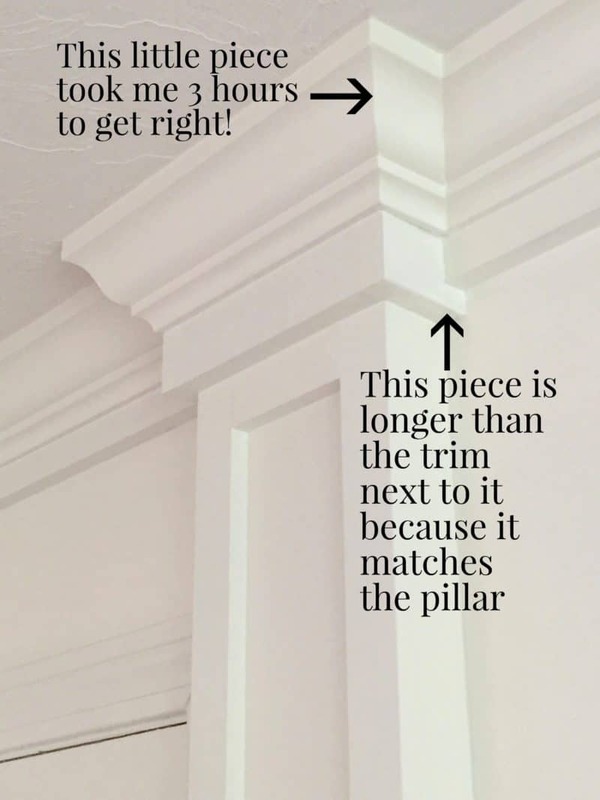 We had the same issue when we put wainscoting in our guest bath and had to consult with our cabinet maker neighbor to figure out what we were doing wrong when cutting the mitered corners. I can’t wait to see how it all pulls together, that new sofa is going to be amazing!! Crown can be tricky but I do love how much it adds to a room! Thanks for stopping by Toni! Lisa, I totally get your reaction to being left with a piece of furniture to move and no help. You go girl for getting it done yourself. 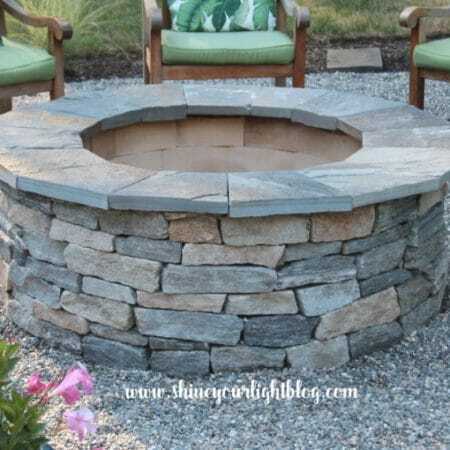 Figuring out all that trim should win you an award. That is not an easy task. Looking forward to the reveal. I’m super impressed with all of the trim work you did! And the sconces look awesome! Can’t wait to see the new artwork along with the rest of the reveal next week! Wow! You’ve been busy! 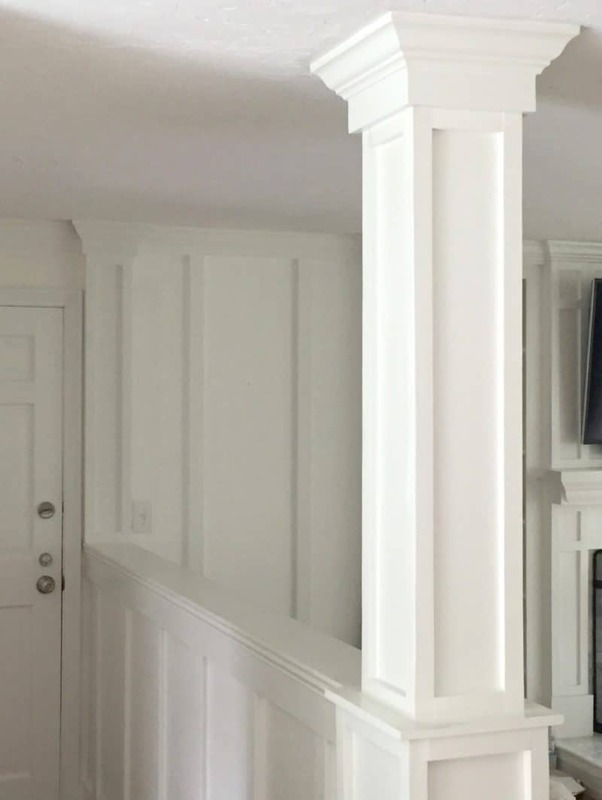 The crown molding looks amazing! And those sconces are so cool. We’re almost there! Lisa, your woodworking talents are phenomenal. Good for you, Darlin’! Even though I follow several blogs and thoroughly enjoy all of them, I have never felt compelled to comment. But this, my dear, could not pass without praise! That is so sweet Lynette, thank you so much for taking a moment to leave me these kind words, they truly brightened my day! My woodworking is definitely not perfect but I do enjoy figuring it all out and doing it myself! Lisa, you are amazing! That molding is truly impressive and I admire you for working on it so long. I would have been huddled in the corner crying with a tub of ice cream long before the 3 hour mark! You are definitely on a mission with the couch moving and all. I cannot wait to see the room come together. I probably won’t be able to post mine until late in the day Thursday since we are a little behind on a few things…ugh. My husband still has to help me put together my bar cart AND the console table. Doesn’t he realize I need time to style them?!! Good luck this week! Wow wow wow! The molding looks amazing!! And I love that light fixture. Funky, pretty, & perfect. You’ve gotten so much done this week! I am in love with that velvet sofa! And the sconces are so cool! This is going to be a gorgeous room, Lisa! I’m so excited to see your reveal – I love that velvet sofa and the sconce is amazing. Lisa I am so incredibly excited to see the final room!!! !